Processes underlying regulation of breathing during development can be revealed by pathologic respiratory patterns emerging during sleep. 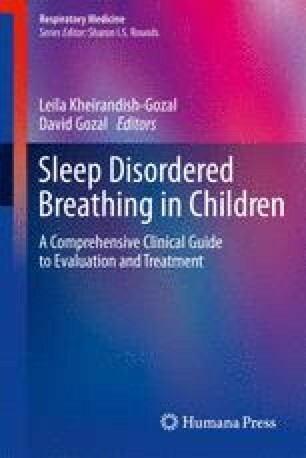 Among these pathologies are obstructive sleep apnea (OSA), extreme periodic or Cheyne–Stokes breathing, and sustained hypoventilation of congenital central hypoventilation syndrome (CCHS). These pathologic patterns are primarily sleep waking state specific and are accompanied by brain structural deficits and impaired neural responses to ventilatory and blood pressure challenges, as revealed by magnetic resonance imaging (MRI) procedures; the aberrant structure and function are useful for outlining both normal and pathological breathing regulatory mechanisms. Functional responses to ventilatory challenges indicate that structures underlying sensory and motor processes to CO2 or O2 are located in multiple brain areas, including more-rostral sites, not usually considered “respiratory” structures. CCHS and OSA patients, as well as heart failure patients who show a high incidence of Cheyne–Stokes breathing, show extensive injury in several brain areas, including cerebellar and limbic sites, which can exacerbate the underlying condition and contribute to a range of ancillary deficits found in the syndromes. CCHS patients show multiple physiologic deficits in addition to hypoventilation, including impaired CO2 and O2 sensitivity, loss of thermoregulation and the perception of urge to breathe, and autonomic dysfunction; these other deficits contribute to the breathing pathology, often use nonclassical respiratory brain areas, and provide an opportunity to partition other not-often-recognized, but significant, influences on breathing drive. The structural and functional MRI findings from these breathing-related pathologic conditions indicate that forebrain, brainstem, and cerebellar structures all participate in respiratory regulation through different ancillary influences. These influences provide a potential to intervene and enhance breathing when primary drives from CO2 and O2 are lacking. The authors would like to thank Rebecca Harper, Edwin Valladares, and Christiane Abouzeid for their technical assistance. This research was supported by NIH HD-22695 and HL-60296.